The University of Georgia's College of Education could soon be named in honor of a Georgia pioneer, thanks to a recently-launched new campaign. The special initiative will name the College of Education for Mary Frances Early, the first African-American to graduate from UGA. Dean Denise Splangler says she and President Jere Morehead have been working on the proposal for just over a year. 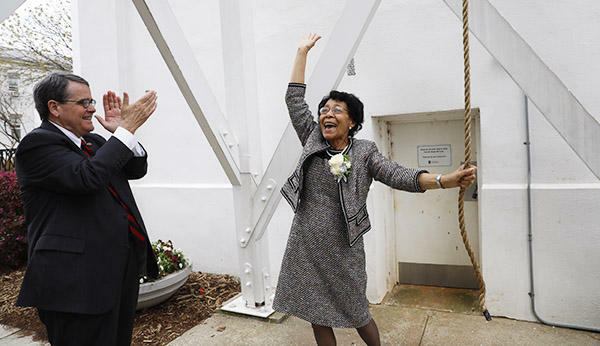 Following her 19th annual namesake lecture earlier this month, Early took a moment to participate in a campus tradition for the first time by ringing the bell at the UGA Chapel as President Jere W. Morehead applauded. The Atlanta native came to UGA in the summer of 1961, the same year Charlayne Hunter-Gault and Hamilton Holmes first integrated the institution. “She’s always quietly, but strongly and persistently, pushed the boundaries to make sure that all students and all people have access to the wonderful education and the opportunities available at the University of Georgia,” according to Splangler. Spangler says Early’s efforts led to success for countless others. President Morehead is providing the lead gift in the effort, with a designation of $200,000 from the President’s Venture Fund. The funds will be matched by the UGA Foundation to create four new $100,000 Georgia Commitment Scholarships for students with financial need. Dean Denise Splanger on initiative to name UGA's College of Education in honor of Mary Frances Early. The University of Georgia hosted the 19th Annual Mary Frances Early Lecture at Mahler Hall in the Georgia Center this afternoon. The lecture is named in honor of the first American to earn a degree from the University. Mary Frances Early spoke at the event.